Thanks to initial funding from the Local Network Fund, we were able to establish our branch resource library a few years ago. We have recently added extra titles thanks to fund raising by our members. With over 350 books, videos, DVDs and educational games available, on a wide range of ASD topics, this is an invaluable resource. The books include a number of Asperger novels for children. Many of these books can also be purchased from the National Autistic Society , Amazon and/or Jessica Kingsley Publishers. The full Library is open at our evening Support Group meetings, usually held on the 3rd Monday of the month and a smaller selection is available at our monthly Family Youth Clubs (please check the Diary dates page for details) . Please see the conditions of library membership and loan in the right-hand panel. The Branch also publishes its own useful information leaflets which can be downloaded here. 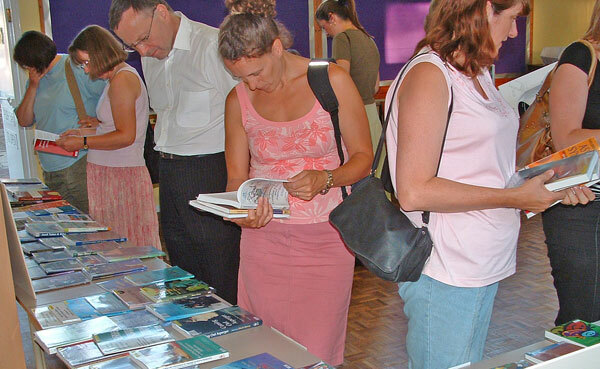 For those unable to attend meetings regularly, members may contact the Branch Chair to join the library and specific items, if available, may be reserved for arranged collection. 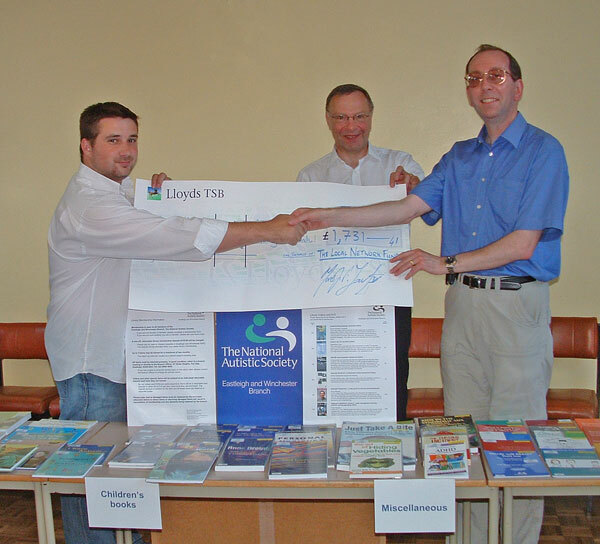 Branch Chair, David Carter, with the cheque which has enabled the creation of the Library. London and SE Regional Director, looks on. Membership is open to all members of the South Hampshire Branch (a branch membership form is available online). We ask for a minimum donation of £5.00 for library membership. Up to three items may be loaned for a maximum of two months. No further items may be borrowed until a library member has returned any overdue loans. No loaned items are to be passed on to other persons to borrow – items are for exclusive use of library members only. All items must be returned promptly, in good condition, either to a branch meeting or directly to the Branch Chair. Videos and other special items will be subject to an individual returnable deposit each time they are loaned. Lost or damaged items must be replaced by the borrower, otherwise failure to return items or returning damaged items will result in cancellation of membership.